London: Ole Gunnar Solskjaer took pride in a ‘classic’ Manchester United display of attacking flair as his side beat Arsenal 3-1 in an absorbing FA Cup fourth-round clash on Friday. First-half goals by Alexis Sanchez and Jesse Lingard put United in control and although Pierre-Emerick Aubameyang replied for the Gunners, Anthony Martial sealed victory late on. Solskjaer has now won eight matches in a row since stepping in as interim manager following the sacking of Jose Mourinho — a record that eclipses even the great Matt Busby. And while the statistics make that the best ever start by a United manager, the vibrant manner in which it has been achieved is perhaps even more impressive. United have scored 22 goals under Solskjaer and have rediscovered the kind of attacking verve associated with the trophy-winning sides Solskjaer played in under Alex Ferguson. What is more, on Friday’s evidence, he seems to have the handy managerial knack of knowing exactly when to shuffle his plethora of attacking options. Martial and Marcus Rashford have been livewires under Solskjaer, but he left them on the bench against Arsenal and started with former Gunners forward Sanchez and Belgian powerhouse Romelu Lukaku. 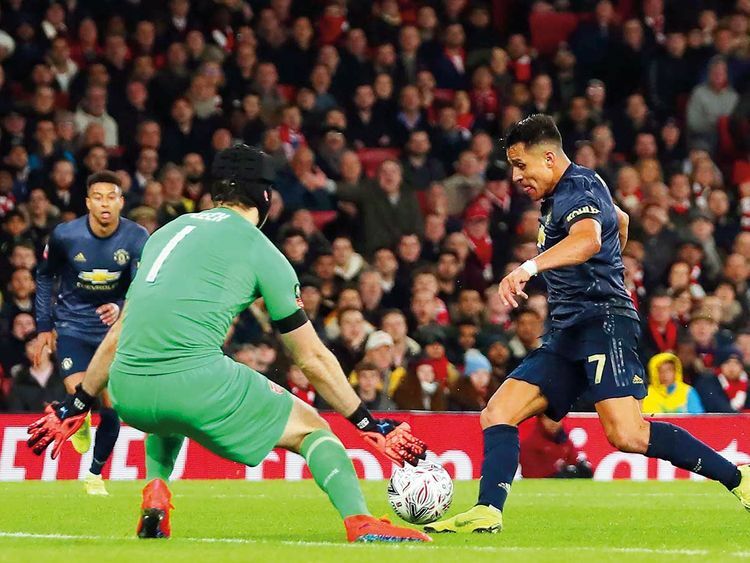 Lukaku, in particular, was superb, producing an unstoppable display to run Arsenal’s defence ragged at times, while Sanchez silenced the boo boys with a sublime opener from Lukaku’s pass. Former Everton forward Lukaku also set up Lingard’s goal. “I’ve had a (selection) headache since I came because the squad is full of good players,” Solskjaer said. “Today we looked more like a proper team. We looked more structured. We’d worked hard at defending and counter-attacking. Counter-attacking is classic Manchester United — Wayne Rooney, Cristiano Ronaldo, Ji Sung-park — we’ve scored so many at Arsenal over the years. “It was a massive step forward today for us. At Tottenham a couple of weeks ago we hung in and [goalkeeper] David de Gea saved us, but today our structure was miles better.” Lukaku summed up the mood under Solskjaer, agreeing that it feels like fun again playing for the club after a torrid spell. “It does, it does,” he said. “We had clear direction today and I’m really happy with the win and the manner in which we played. Look at the history of the club, we make a statement wherever we go. “We look to dominate and create as many chances as we can.” Arsenal boss Unai Emery could only look on with envy at the attacking resources available to Solskjaer and which were inexplicably so subdued under Mourinho.